These are countertop units, consisting essentially of a bowl with a detachable lid on it. A halogen bulb or other type of heating element in the lid provides the heat. A convection fan will be in the lid as well. The major consumer complaint about halogen heated ovens is their very short life span, by design it seems. 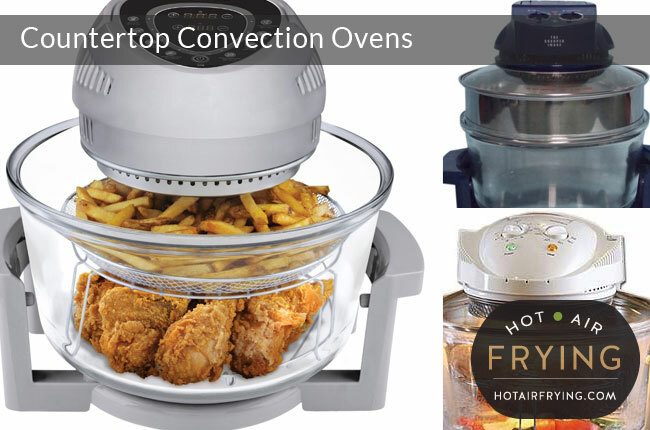 Note that not all countertop convection ovens have the convection (fan-assisted air movement), so wouldn’t technically qualify as an air fryer. For most models, the heat and the fan are the only electrified parts. 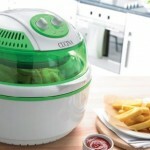 This makes them like basket air fryers, in that anything being air fried in them must be tossed manually. One or two models have moving rotisserie baskets in them, making them a bit more like paddle-type fryers in that they can turn for you the product being cooked. For all, though, you need to brush or spray oil on the food being air-fried before starting cooking. With many models, no pre-heating is necessary. On average, power levels seem to be adjustable from 40 C (105 F) to 170 (340 F), but this range varies greatly by manufacturer / model, so do check. Ones that go low enough can be used as a dehydrator, though of course the space inside is teeny compared to actual dehydrators. For those outside the US, note that a 110v machine also works with 120v — the two voltages are basically the same as far as the appliance goes. The light from the halogen lamps can be quite bright and light up an entire kitchen (some say their neighbours thought ET had landed in their kitchens), and will turn off and on as the device maintains temperature. Some models can cook food quite well starting from frozen, straight from the freezer. Others do better if the food is thawed first. To cook frozen items more evenly, consider putting the meal on the lowest rack, so it’s less close to the heat source, and starting with a lower temperature than advised on the food packet, then raising the heat to the recommended temperature after a bit. Many people suggest starting off frozen pizza covered with tin foil and then removing the foil after a bit, so that the top is not cooked before the bottom. On some models, a strong fan can blow seasonings, dry rubs, crumb coatings, etc off the food being cooked. Even lightweight food such as egg rolls, spring rolls, lumpia, etc can get blown around if the fan is strong enough. To prevent that, you can start the food off for a bit covered with tin foil, then remove it after a bit so that browning happens. Just be sure to tuck the tin foil edges securely under the food, so that it too doesn’t get blown around and possibly end up blocking the fan. Be aware that the glass cooking bowls can get very, very hot. Handle only with oven mitts on during and immediately after use. Do not immerse the hot glass bowls in water. Make sure you operate the ovens on heat-proof surfaces. NEVER fill the bowls with oil to try to use them as deep-fat fryers. This would be extremely unsafe. One complaint about counter-top convection ovens is a seeming dearth of recipes for them. We’ve created a page listing some recipe sources for countertop / halogen ovens. On a few models, the lids are plastic, but for the most part, the lids are made of sturdy glass. Some people say the plastic lids, while lighter, are harder to clean and prone to cracking. The lid can be a bit heavier than you might think at first, because all the mechanisms are attached to it. But even most seniors generally find the lids still quite manageable. Many of the ovens come with a bracket / rack to tilt the lid onto when you lift it off to check on the food. Ideally, try to tilt the lid a bit away from you when lifting to avoid getting a blast of steam coming at you. Most models seem to accommodate an “extender ring” (aka “extension ring”), which extends the height of the bowl. Extender rings are useful to raise the lid because it is generally advised to keep food 10 cm (4 inches) below the lid of countertop convection oven. This allows larger items such as small turkeys to be roasted in the ovens. Sometimes the extender ring is included; other times it is an additional purchase. Before purchasing, be sure to clarify, as most people using these units seem to feel it is very important. Many come with two racks, a lower one, and a tall one, and you can use them both at once to cook things such as potato wedges on the lower one, and fish on the top, provided both items require the same temperature and you put them in at the appropriate point in cooking time for each. When you are baking stuff on two layers, though, expect to need to shuffle the layers around for even cooking so that the top layer directly under the heat isn’t burning while the bottom layer of baked goods is still raw. Double layers of French fries may not cook satisfactorily unless removed from machine, shaken and replaced. Many come with a triangular-shaped wire accessory. This is a set of tongs, used to pick up the wire racks when hot. You can use any dish in these ovens that is regular oven safe, as long as it fits in. Which means, don’t use microwavable plastic dishes, and only use frozen dinner “plastic” dinners if the packaging says it is regular oven safe. Good for RV ( recreational camping vehicles), dorm rooms, studio apartment kitchenettes, camping with generators, houseboats, to take to parties and pot lucks and church suppers, etc. 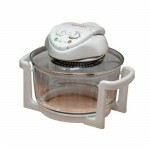 Many seniors and single people like these small countertop ovens because they are only cooking small amounts of food and don’t want to be turning on a huge oven. These ovens heat the kitchen up less in the summer than a big oven, so some people especially in the American south switch to these as their summer ovens. On big holidays, a countertop oven gives you a spare oven to use. Some countertop ovens can be as heavy and cumbersome as a stand mixer, so either you need to not mind hauling something like that in and out of a cupboard, or, have the counter space for it. All units will make some fan noise to some extent or another, at least as much as a microwave fan, usually. The complaint about fries in most of them appears to be how fiddly it is, and how few can be made at one time. You have to spread the fries out on a rack, being careful not to layer them or pile them up. Some of them have racks with the tines quite far apart that the fries can fall through, so you have to arrange them carefully. Half way through cooking, some people say they remove the rack, dump the fries in a bowl, toss them, then rearrange back on the rack and finish cooking. Some models such as Air Fryer and Rotisserie Multi Cooker (Good Cooking / Liven) get around this by having a tumbling basket that turns, automatically tossing the fries for you. Don’t pile food up and expect it to cook; you have to layer the food out. In general, fries in these devices are best done in only one layer on each rack (generally there are two racks), so only a small portion can be made at one time. You can cook veggies and meat at the same time, on the two different level racks that almost all these ovens ship with. You just have to get the timing right for when to add each. Many people like the ovens for roasting coffee beans in. They can even be used to toast bread in. Some users report that splattering grease from items such as beef patties can cause the halogen bulbs to explode, so they advise to cook those items on the lower-level racks. Many food items such as chicken wings, fries, etc, will probably need turning or shaking part way through cooking. most of the bowls are dishwasher safe but some users find some bowls take up too much room in the dishwasher so they prefer to wash by hand. Do NOT turn timer dials counter-clockwise or you may break them. Digital timers allow you to adjust cooking time, or pause it. Most food items cooked in it need to be flipped, so at the start of cooking set the timer for only half the expected time. A common complaint is that lettering can wear off the dials quite quickly. Some people advise putting clear tape over the lettering to protect it. Mostly, though, many models of countertop convection ovens seem sadly to be not very long-lived owing to issues with the heat source. As they almost all have only a short one-year warranty, you may wish to buy with as great an extended warranty as you can. A short life span is particularly true of halogen-heated models. On most of these, when the halogen bulb burns out, the unit is effectively garbage. Many of the bulbs seem to be hard wired into the top and hard to replace when they burn out. Only a very few manufacturers made the bulb replaceable and sell the replacement halogen bulbs. But, people say these replacement parts are expensive and require a lot of specialized expertise to install back into the units, so it can be cheaper and easier to buy a whole new machine. In doing your research before buying, you probably should try to contact the manufacturer to clarify what happens if you need replacement parts. Some manufacturers are overseas with no part facilities locally, meaning you just can’t get spare parts at all at any price. If you need replacement bowls, often people suggest looking on eBay for people selling them after the electrical part of their machine has packed it in. It is best not to use these countertop ovens for slow cooking. These are not meant to be slow cookers, they are rocket ships designed for speed, as one Amazon reviewer put it. Besides, running it as a slow cooker for hours will just burn out your halogen bulb that much faster. A common complaint is that few of these ovens ship with adequate cookbooks to get people up and running in how to use them. If you are shopping on Amazon, watch out for convection oven books that might be “recommended” to you there. Not all are for these countertop convection ovens, some are for full-size convection ovens and won’t be relevant to your countertop use. 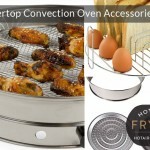 We’ve listed some cook books for countertop convection ovens on this page: https://www.hotairfrying.com/hot-air-frying-recipe-books/ . Please note clearly that in my observations above, I am just reflecting on what I happened to read users saying during my survey of the field. You need to just use that as a starting point for your own purchasing research and verify to see if what people were saying in the fall of 2014 is still true now. Above all, before purchasing, you may wish to ask lots of questions about reliability and serviceability one or two years down the road. You can do so in Amazon product review threads, or on user groups such as this countertop convection oven user group on Yahoo. Too many people purchase halogen ovens, find the bulb burns out on them after a few months of use, and end up being the proud owners of a boat anchor that can’t be fixed. Do your research so your hard-earned money doesn’t end up in landfill; it’s not doing the environment any good, either. (2) the Secura Infrared Turbofry. Whatever else its features or flaws, a non-halogen oven should at least avoid the common problem of an irreplaceable halogen bulb burning out on you. Capacity: 20 US quarts / 20 litres Bowl: glass Extender ring: yes, included Sold in the Middle East. We had a Jet Stream oven (3or4 units over the years) several years ago and the top on every one of the would eventually crack . This make me Leary of getting one now.